At first, I thought that both Lupin-X and Patren-X are two different persons but as Ukiyaseed and JEFusion have mentioned it -- they are two different modes of just one freaking character. It's just like how Kamen Rider Black RX and most of his successors all have multiple modes for combat. We're having a mysterious character in here and I just got so encouraged to write this speculation BECAUSE of a recent discussion video at JEFusion has someone who uses the screen name Nikko Amano has a pretty insightful speculation. This also caused me to break out from my decision to just focus mostly on episode reviews and to make speculations yet again. Sidenote, I also did something similar when I saw scans of Don Armage's other forms for the finale arc last year. 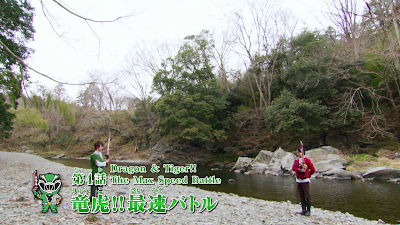 I remembered a lot of wrong guesses that I made when Lupinranger vs. Patranger didn't air yet. I thought that Lupin Red would be a descendant of Arsene Lupin -- instead Kairi was merely employed by a descendant of Lupin. Some sources erroneously reported the butler to be that descendant prior to the show's airing. Man, it's very easy to make a lot of mistakes, huh? But right now, I do have another guess that shares the same with Nikko Amano -- Lupin-X/Patren-X will actually be this descendant of Lupin. Whether or not he will still be named Arsene is not known. Question is -- will we get a French actor or at least a half-French actor to play said character if ever he will have a human form? I was looking through a series of scans and even next week's preview and here's what's obvious -- the VS Vehicles can actually combine with each other. We've seen a preview of Lupin Kaiser using the arms of Pat Kaiser. Other magazine scans feature a cluster mecha that will combine both mecha from the Lupinrangers and Patrangers. If ever this upcoming hero will be a descendant of Lupin then maybe, he also ordered Good Striker to knock out the Trigger Macine Biker out of the Lupinrangers and into the hands of the Patrangers. Maybe, he's also ordered Good Striker to side with either which team would be appropriate to get both team to finally work together. 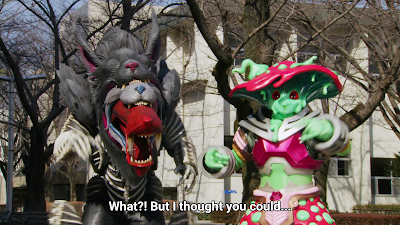 From what I heard that the mysterious extra ranger may first appear in episode 20 (?) but that's not yet even confirmed. Right now, we're going into episode 18 this Sunday for Super Hero Time. Will we get slight glimpses of who he is? How will he eventually get introduced into the series? I can't wait to find out what will happen next.